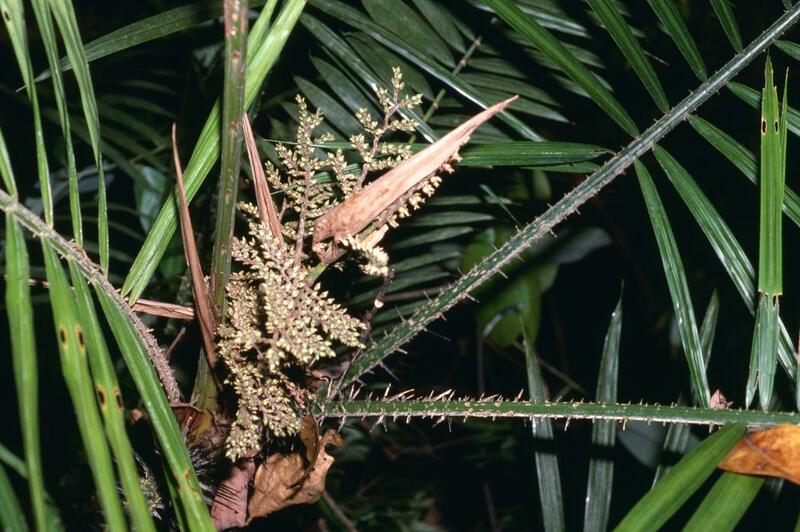 This species is accepted, and its native range is W. Malesia to W. Philippines. 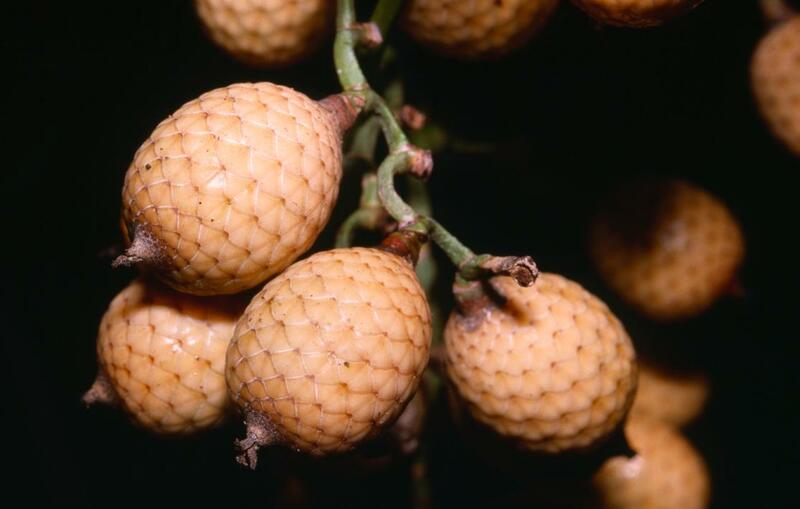 Clustering rattan with short to long, moderate to robust stems, sometimes forming low thickets, rather rarely high-climbing, very variable in all its parts; stems without sheaths to 30 mm diam., with sheaths to 50 mm diam., internodes usually short, c. 5 cm long, rarely up to 12 cm. 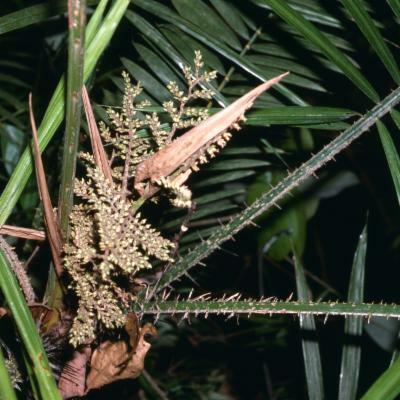 Sheath bright green, armed with large brownish-black, flattened, reflexed spines arranged in horizontal to slightly oblique groups, those around the sheath mouth sometimes crowded and erect, usually c. 4 cm long, more rarely up to 8 cm, occasionally with black spicules between the spines, and usually with dense brown indumentum; knee absent; ocrea short, rather densely covered with black spicules. 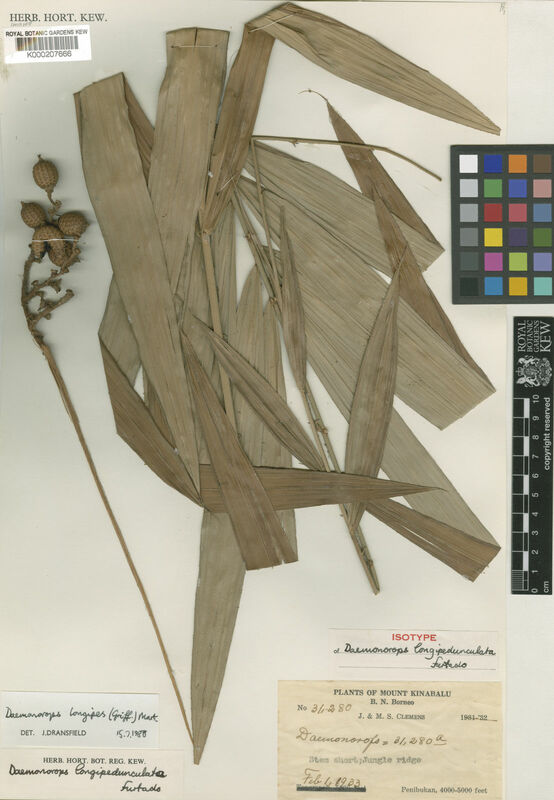 Leaf sometimes ± ecirrate, usually with a short cirrus, occasionally very robust to 4.5 m including the petiole to 50 cm and cirrus to 1.25 m, but usually much less, c. 2 m long; leaflets 30-60 on each side of the rachis, usually irregularly arranged, rarely subregular, frequently aggregated in neat groups of up to 5, rarely divergent within the groups, the longest to 50 × 3 cm, usually bristly along the margins and along the mid vein on lower surface. Inflorescences borne on laterally flattened peduncle, the female tending to continue to elongate after fertilisation, the peduncle to 1 m, usually less, unarmed, or armed with few lateral spines; bracts very narrow, papery, unarmed, quickly falling; male flowers close, strictly distichous, female flowers more distant. 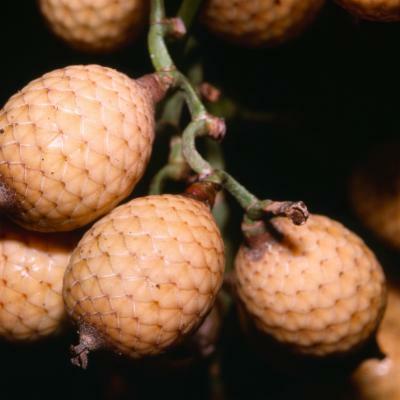 Fruit usually ovoid, more rarely ± oblong or spherical, to 25 × 8 mm, usually less, covered in 15 vertical rows of straw-coloured or dull brown scales. Seed to 16 × 10 mm, oblong; endosperm deeply ruminate. Seedling leaf with 4 leaflets held in a fan. (Fig. 26, Pl. 7C). Very widespread throughout Brunei. Elsewhere throughout Borneo, Sumatra and the southern part of Peninsular Malaysia; also in Palawan.